Yummy Vegan Ramblings: Bourbon Biscuits. A mixture of advice, opinions and recipes for anyone interested in a vegan lifestyle. I was getting some bourbons for my omni-friends the other day and decided to check the ingredients just on the off chance that they didn't contain milk/egg. 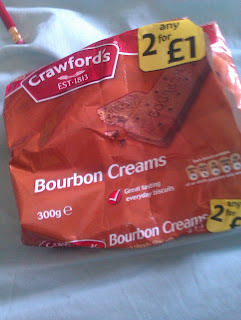 I've always assumed bourbons would so I stick to rich tea as they're usually a safe bet but these bourbons were vegan! Did you make the cookies? I used to eat bourbons when I was vegan. Some of the more expensive brands have diary in but the basic ones tend to be vegan. The same is true with sweet mince pies I believe - my Dad loves them and can eat almost all of the pre-made ones except for M&S, Waitrose and some home-made because they add milk or butter. I've been a waggish vegan for five years now and along the way I've learnt a lot but still have so much I want to learn. By chronicling my forays into vegan cooking and living I hope somebody will find some small shred of inspiration or at the very least have a good old laugh at my expense.